The pricing proposal is the scariest moment in working with a potential client. You’ve been talking to them, they like your work. Things are going well. Then they ask about your fee. You reply with a short, friendly email listing a reasonable quote. Or, if you’re a bit more savvy, you write up a quick invoice estimate. This is where two thirds of potential clients cut and run. Why do so many prospects balk at a perfectly reasonable fee? Clients don’t bail because of the cost. They back off because of the cost presentation. It’s not rational. But it’s true. Because of basic human psychology, leads look at a traditional pricing proposal and get spooked enough to turn you down two out of three times. Even though they were probably the ones that approached you in the first place. What if you could style your pricing proposal to land more customers AND not have to compromise on your fees? But before we get to that, let’s take a look at the shortfalls of traditional pricing proposals. There are two kinds, and each one has some significant shortcomings. One glaring issue is that the informal email quote turns the freelancer/client relationship into a Yes or No, All Or Nothing equation. You have just one chance to get it right, and there’s no opportunity to offer enhanced value for your client. Another problem is that the email quote nails the client’s focus to the price, rather than the results the client is looking for. This leads into another issue: bargain hunting. When the only difference you offer from your competitors is a price point, clients will go shopping for the best deal they can get. Lastly, one of the biggest problems with the email quote is that its informal style can deter big clients. High-value customers are often more comfortable with a certain sheen of professionalism. You might do great work, but if the casual nature of your email quote makes the client uneasy, they’ll probably take their business elsewhere. Okay, so no informal email quotes. What you need is something a little more professional. Something that opens the door to more options, more value. A list of services you provide, each with an hourly rate, totaled up in neat columns with a final tally at the end. Everything you’re offering is laid out in polished, exhaustive detail. What could be more professional? Sending a client an estimated invoice might seem like the perfect way to quote a price, but it comes with its own set of big problems. First, charging an hourly rate take the client’s focus away from the results they’re asking for, and emphasizes units of time or the cost required per task. Also, labelling services invites clients to compare your prices with your competitors’. You’re commoditizing your labor. You offer a special service, a real solution for the client. But when you let the dollar value of your work become the focus of communication, you’re lowering yourself into a vast pool of virtually identical competition. Invoices can also make things too complicated. A list of various services, each with its own dollar cost, quickly becomes cluttered with options and add-ons. If a client is confused, they probably won’t hire you. Fees should be simple and communicate value. On top of that, the human brain’s structure makes people more motivated to avoid losses than to pursue gains. When a client sees that neat list of fees you’ve written up for them, each individual cost is hitting them with increased psychological weight. That just doesn’t sound fun. So invoice pricing proposals are out, too. What you need is a proposal that sets you apart from the pack. A proposal that is professional, but not confusing or intimidating. A proposal that tells the client that you can solve their problem, and that your fee is nothing compared to the value they’re getting from you. Simply put, the bundled pricing technique puts the focus squarely on the client and the solution to their problem, rather than the time or service you’re putting into the project. It encourages the client to switch their mindset from loss avoidance to the embrace of opportunity. If that picture is too starry-eyed for you, consider this: Traditional pricing proposals are accepted 34% of the time. Bundled pricing proposals are accepted 47% of the time. Yeah. Just changing the way you present your fee can increase your acceptance rate by more than a third. At Bidsketch, we recently researched pricing on 25,000 proposals and found that the most profitable proposals were doing a few key things. You can view the full infographic based off our research, right here. This proposal template for marketing projects includes a worksheet, multiple designs, and uses the bundled pricing technique. Website proposals can be a pain to write from scratch, with the proposal bundle above, you’ll get multiple templates, worksheets, and even a retainer version. Your ability to land agency clients largely depends on focusing on what agencies deliver that consultants and freelancers can’t. This proposal uses everything we learned in our research to help you land your next client. Proposals for mobile projects are similar to ones for software development (with a few key differences). This template uses the right structure to help you land your next deal. This social media proposal template includes bundled pricing, multiple cover page designs, a worksheet, and more. Need for some other type of proposal template? No worries, we’ve got you covered. We created an entire proposal template library that’s free to download. Ok, so let’s now dig into how you can put these lessons to work in your own proposals. Bundle your fees into a single solution. Limit the options you present. Let’s look at each of these steps a little further. The bundling is the most important step; after all, it’s what the the technique is named after in the first place. Here’s where you use psychology to both your and the client’s advantage: instead of listing a service, you present a benefit or a solution. Describe how you will solve the client’s problem. Let’s say, for instance, you make websites. A representative from Bob’s Fishing Tackle shoots you an email. Hi there, I’m Steve from Bob’s Fishing Tackle! Bob himself was saying to me the other day, he was saying, ‘Steve, our website is looking a bit long in the tooth. It might be time for a redesign.’ We heard you do good work with internet things, so we were wondering, Bob and I, what you might charge for such a service. First, let’s see what the invoice estimate for this kind of job might look like: a list of services, estimated hours or units for each, and a final cost tally per row. That’s a lot of numbers up there. Steve doesn’t see ‘Website design.’ He sees $10,000 dollars going out of his and Bob’s collective pockets. Then he feels an additional $5,000 leaking out. Then $8,000 more, gone. By this point, Steve’s ready to convince Bob that their site isn’t old. It’s retro. And retro is very in right now. Now let’s see how things might have gone down if Steve got back a bundled pricing proposal instead. Website Redesign – We’ll identify what parts of your current website are attracting the most engagement and capitalize on those features. Then we’ll find the parts that are underperforming and structure them to funnel your leads into sales. Logo Design – We’ll research your ideal customer base to identify an aesthetic that draws the kind of attention you want, and design a new logo built to resonate with your audience. Google/Bing Optimization – We’ll pinpoint the way that your ideal customers browse the web, and build a unique SEO solution to double your search engine traffic. See? By removing running cost tally and references to units of time or service, and replacing them with a sharp focus on benefits to the client, you’ve created a much tighter, better selling pricing proposal. Step 2: Upsell With The Right Options. Most freelancers upsell with an additional related product. For instance, if their core service is website design, the upsell might be a social media campaign. The problem here is that social media isn’t what the client came to you for in the first place. So in addition to having to convince the client that you’re the one to go to for their website design, you also have to convince them that a social media campaign is something that they need. That’s a lot of selling. Instead, offer enhanced options. That way, you don’t have to do any more convincing. The client is already sold on your service, you’re just offering to make that service even better. So if your service is website design, maybe you could offer the enhanced service of mobile-responsive site programming. If your service is designing web advertising banners, offer the enhancement of making those banners interactive rather than static, for more customer engagement. Don’t sell the client on something new. Offer them a better version of something they’re already buying. Have you heard about the supermarket jam study? Researchers set up a sampling table at a grocery store with a variety of jams for customers to taste. Then they tracked how many people actually bought the jam. One day, they had six flavors of jam available for tasting. 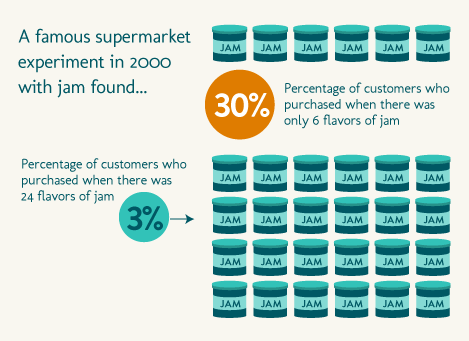 A full 30% of people who tasted the jams ended up buying a jar. That’s not bad, right? If a third of leads turned into sales, we’d all be pretty happy campers. The next day, the researchers set out a whopping 24 flavors of jam. There were combination jams. Wine jams. Jams from fruits the likes of which suburban America had never seen. Such astounding variety surely captured the imaginations (and pocketbooks) of the sampling public, no? How many fine folks purchased a jar of jam that day? Yes. That’s not a typo. That is a single digit. Only three out of every hundred people who tasted the jam bought a jar, even though there was a much wider variety to choose from. Too many options causes confusion. Choice paralysis. Offer, at most, three options. When presented with three options, most people choose the middle one. Make the options significantly different in price. This will make the decision easier for the client. The bundled pricing technique consistently results in more sales, more money, and happier clients. Remember, focus on customer benefits. Give a package price for your entire solution. Upsell with enhanced options, rather than add-ons. Keep it simple.